The gender imbalance in STEM fields is extreme. According to a 2010 AAUW report, boys and girls take math and science courses in roughly equal numbers in elementary, middle, and high school, however far fewer women than men pursue these fields in college. According to the National Science Foundation, 29% of all male freshmen planned to major in a STEM field in 2006 compared to 15% of all female freshmen. Further, while 57% of undergraduate degrees are earned by women, only 12% of computer science degrees are earned by women. By college graduation, men outnumber women in nearly every science and engineering field. Society is leaving a huge talent pool on the table. Women can bring diversity and a different viewpoint to STEM fields, and this resource is extremely underutilized today. As girls are as equipped as boys to enjoy and excel in STEM careers, how can we turn the tide and help undo some of this early conditioning? One way is to interest them with toys that fit their frames of reference, while bringing in some element of technology for a soft landing. 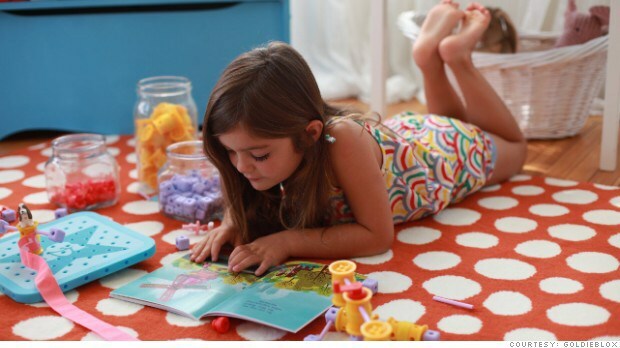 The Goldie Blox book and toy series is an example where a character is portrayed as a “princess turned engineer.” The toys teach spatial skills and engineering principles. For older girls, Romotive offers a mobile toy robot powered by an iPhone that girls can program graphically, without writing a line of code. It takes a little bit of work, but it is possible to find fabulous technical toys that appeal to girls. Of course, gift-giving is seasonal and episodic, and can only be a tiny part of the solution. To reach girls effectively, advocates of STEM need to work with girls where they spend the most time. At school, teachers should make sure they set high expectations for girls as well as boys, stretching them beyond their comfort zones and inspiring them to excel. After-school activities should pay particular attention to recruiting and retaining girls in STEM-related activities, perhaps creating all-girl STEM experiences to help build a community around female students who are interested in this area. At home, parents should make sure they encourage boys and girls equally in the pursuit of STEM interests. The use of female role models is a particularly potent tool. The Science Club for Girls is a great example: It connects K-12 girls with female scientists or engineers who serve as role models. It also has a leadership program where teenage girls become role models for younger girls. STEM is cool — girls can and should embrace this at a young age. Women in STEM careers should also be very open to putting themselves forward as role models. For example, a parent in our elementary school is a tenured professor in geology. Every year she brings her rocks and crystals and shares her work with children at the school. Her child has long graduated, yet she cheerfully returns every year to share her excitement and enthusiasm about her branch of science. This is probably the most fantastic way to expose girls to STEM. As we encourage more girls to focus on STEM areas, look for communities that can serve as central connectors. MIT serves this function with its K-12 programs, like the Edgerton Center’s intensive summer programs and outreach to local schools. Many other schools around the country offer STEM programs for K-12 students. Once you find them, share the information with other parents and encourage your daughters and their friends to participate together. We need to sow the seeds of interest in young girls now, and nurture that interest as they grow. There are many ways to do this. It starts with you, and it starts today. Take a look at your gift list. Will you help this cause by changing your gift list for your daughters, granddaughters, nieces, and young female friends?